They led a mission to Nepal to support the efforts on inclusive approaches towards SDGs implementation. Aleksander Kwasniewski, former president of Poland (1995-2005) and World Leadership Alliance - Club de Madrid (WLA - CdM) Member, alongside Teresita “Ging” Deles, former presidential adviser on peace process in the Philippines, led a mission to Nepal to advise and support the efforts of elected officials, political leaders, civil society, and representatives of the international community on inclusive approaches towards SDGs implementation. 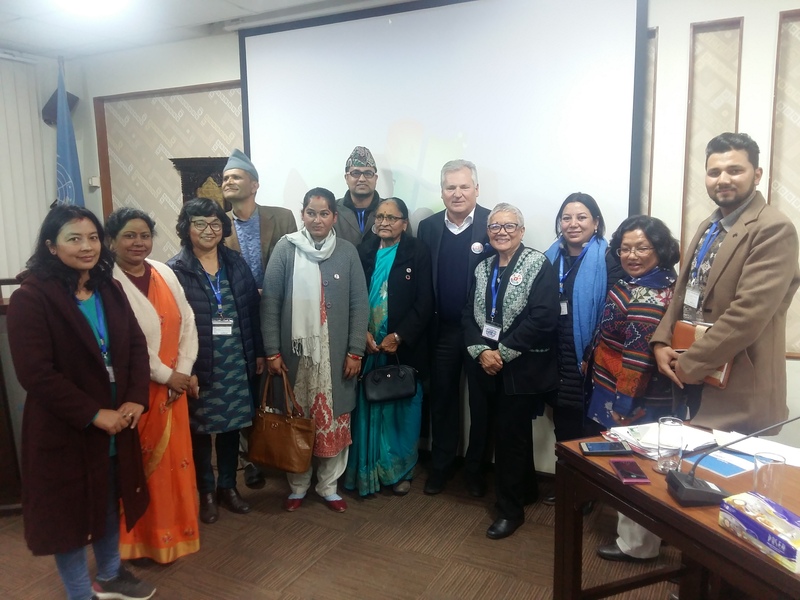 The mission took place between January 28th and February 1st in Kathmandu as part of WLA - CdM´s Shared Societies Project, with the objective of reinforcing the commitment of key political leaders to the adoption of an inclusive approach to planning, implementing, and monitoring the Agenda 2030 into national and local development plans. The Shared Societies Project supports a holistic approach to sustainable development, integrating social, economic and environmental dimensions, with social inclusion at its core. This was the third mission to Nepal organized by WLA-CdM to Nepal following the 2017 and 2014 member-led missions. Following a decades-long period of armed conflict and prolonged political transition, Nepal now aspires to emerge as an inclusive and equitable middle-income country by 2030. The country´s National Planning Commission has identified several challenges to this end, including the mainstreaming of SDGs into provincial and local planning, investing for employment creation, disaster management, and capacity development. Member Aleksander Kwasniewski met with Nepalese political leaders, including President Devi Bhandari and PM Khadga Prasad Sharma Oli to discuss how decentralisation, a key element of the new Nepalese constitution, can foster inclusivity and support SDG implementation in the country. In an interaction program with civil society and parliamentarians, President Kwaniewski said, “We cannot build democracy without human rights. Civil society in an inclusive setting must be ready to fight for those rights”. The event was co-organized by the UNDP Nepal office, in addition to an exchange with youth leaders on the topic of SDG implementation that took place the following day. President Kwaniewski and Teresita Deles were also able to meet with youth groups and a United Nations SDG Working Group on the localization of SDGs and the future of democracy. Throughout the mission, the delegation met with the Ambassador of the European Union in Nepal, as well as the United Nations´ Resident Coordinator.